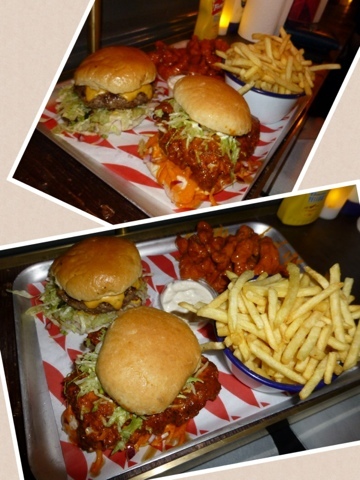 Last year saw an explosion of ‘Dirty’ burger joints onto the London restaurant scene and the leader of the pack was MEATliquor. 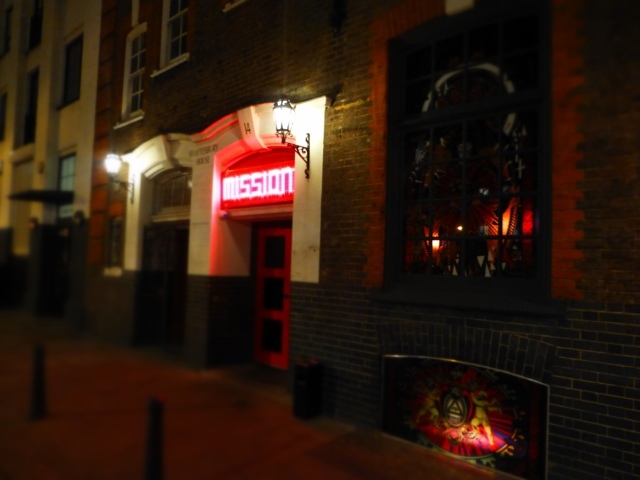 It started out as a MEATwagon, but proved so successful that there are now three more restaurants in the MEAT stable and it was the newest one, MEATmission, that I chose to pop my ‘dirty’ burger cherry on! TBH works in Old street, which is within walking distance of MEATmission and why we chose to go to this outpost. It is thus called because it is housed in an old Christian missionary on Hoxton Market. The decor is dark and moody with a gorgeous stained glass ceiling. The pictures hung on the walls all have some religious connotation and there is even a confessional booth that has been turned into a photo booth, which you are given a token to and encouraged to take some fun pictures! We arrived at around 20:30 and the restaurant was absolutely packed, but we were happy to take a seat at the bar and take in the atmosphere. The soundtrack went from MC Hammer, to New Order to Dolly Parton. Bonkers, but somehow it worked. I was unsure of what to drink as I was feeling a little tender from the night before, but André the barman took the time to find out what I liked and didn’t like in a drink and then created me a fantastic gin based cocktail with passion fruit. TBH had the ‘Pinot Grincho’ – grapefruit vodka, apple liqueur, passionfruit and Pinot Grigio cocktail that came decorated with a little candy cane. Very cool, but probably a bit girly for him. While supping on our cocktails, we were taken through to The Sitting Room, which is the part of the restaurant that takes bookings, and were seated at a bench overlooking the kitchen. I loved the bottles of Heinz ketchup, French’s mustard and rolls of paper towels on the tables. This was going to get messy. 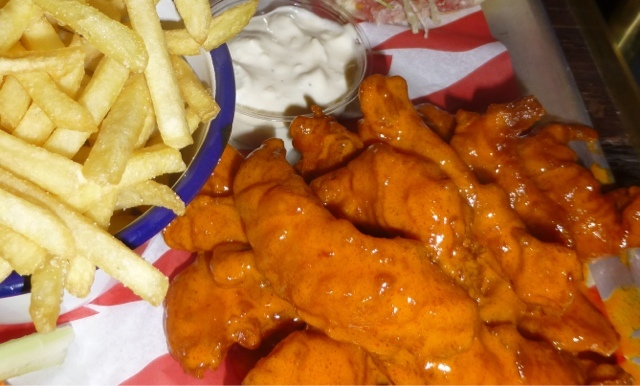 A ‘burgerette’ as the like to call them, came over and took our order, we decided on Monkey Fingers (£6.50) which are deep fried chicken goujons with a hot sauce and a creamy blue cheese dip. Like buffalo wings, but without all the work involved in eating them. Genius. The portion was huge and the spicy sauce totally more’ish. I am still thinking about them 2 days later! I chose the Cheeseburger (£6.50), a signature burger. The American cheese melted oozingly over the solid beef patty that was cooked to a perfect medium. (I was surprised not to be asked how I wanted my burger cooked, but was really happy with the way it came) There were also some sharp pickles, lettuce and a tangy sauce that I couldn’t quite place. Ketchup, mustard, mayo? All three? Who knows? But it was good! I enjoyed every last bite. TBH ordered the Buffalo chicken burger (£7.50) A deep fried chicken breast with more of that yummy buffalo sauce that came with the Fingers. The chicken was juicy and the coating still retained its crunch. I would’ve thought the sauce would’ve become a bit same’y, but he seemed to love it. Finally, we ordered a side of fries (£3.00). You can’t order a burger without fries in my opinion. But in all honesty I could’ve done without these for two reasons: 1) The burger and the portion of Fingers were huge 2) I didn’t actually like the fries! They were reminiscent of a well known burger chain’s fries, a little like cardboard and not much else. The only real dud note in an otherwise great meal. Service was efficient, the staff all look happy to be there and although we did have a bit of a wait for our food, I didn’t mind it very much. The atmosphere is cool, the soundtrack is different to anything you would find in any other restaurant and there are lots of interesting things to look at. But most of all, the food is pretty damn fine! MEATmission have two new converts! For a great ‘dirty’ burger experience, make it your mission to check these guys out. The bill for 2 cocktails, 1 beer, 3 diet cokes (I was hungover, ok? ), Monkey Fingers and 2 burgers came to £51.30 excluding service.